Description: An eastbound manifest rolls by the industrial spur at West Gerlach. 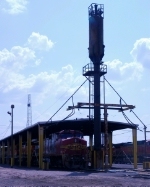 Description: Part of the BNSF maintenance and repair facility in Topeka, KS. Taken from above the yard on the Branner Trafficway. 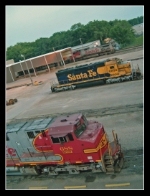 Description: A going-away view of this colorful trio on the point of an eastbound general freight. Description: Rolling through Long Lake on a late October afternoon is this eastbound general freight sporting this colorful lashup. Title: Grain under my feet. Description: A grain train heads north under the World trade center pedestrian overpass. Title: BNSF 688 refueling in Thomas yd. Description: H-GALCWY has a 25mph slow order today. Description: Atleast it wasnt an all orange lash-up. Description: Not the best weather today, but it's hard to pass up a pair of warbonnets in 2009. Description: The three big units were on an Ethanol MT, the RRVW came down with there cut of grain cars and the ILSX units. they put it all together and were about to head down to the CP diamond and head to Hankinson. 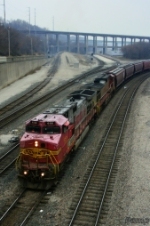 Description: An intermodal waits for a turn to cross the Tower 55 diamond. Description: A minimally patched Warbonnet idles in the rain.